Everything you need to know about Carrot Juice! Around 2,000 years ago, the peoples living in Afghanistan discovered the edible sweet root of the simple carrot. From there it spread outward and began to be cultivated as a food staple by the Indians, Japanese and Chinese, reaching England around Elizabethan times, and finally in the 21st century, rising to become one of the most recognized and important symbols of the modern health movement. And for good reason! Tuberous vegetables like carrots store their nutrients in the large root, allowing regrowth from one year to the next. This is why root vegetables often contain concentrations of vitamins and minerals and an array of phytochemicals. Weighing in at a mere 30 calories, a single medium carrot will contain 330% of your daily requirement of vitamin A. One 8-oz. glass of carrot juice contains a whopping 20,000 mg. of vitamin A. Toxicity can occur when vitamin A is taken in as a supplement, but it is completely safe in vegetable form. Like all root vegetables, carrots are also packed with minerals. Carrots are rich in organic calcium, which is invaluable to bones and teeth. They are an excellent source of vitamin C and most of the B complex, as well as iron, potassium, phosphorus, and sodium. The vitamin A (beta-carotene) in carrots is an antioxidant that is able to attach to free radicals in the body. The damaging effect of free radicals has been associated with cancer. We all have natural killer cells that search the body for tumor cell growth. These killer cells are a vital defense system in protecting the body from cancer. A recent study coming out of Boston by 59 physicians discovered that these natural killer cells’ functional ability was much higher in elderly men who were supplementing with beta-carotene pills for ten years, compared to men who had not. Flush the pills—it’s been shown that supplementing is less effective than simply eating the complex array of nutrients naturally found in fruits and vegetables. 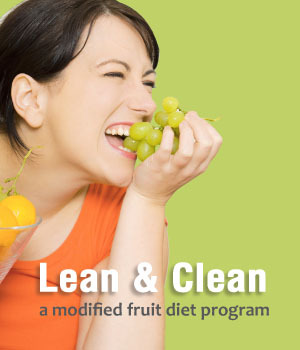 This is enhanced to an even greater degree during juice fasting. 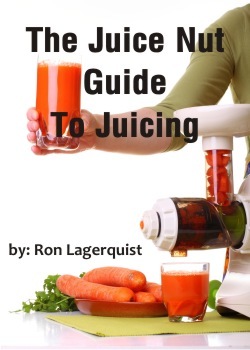 The juicer releases the nutrients locked in the cells of food, removing the need for digestion. Instead of the body being overloaded with “dirty” calories, only nutrient-rich, liquefied food is introduced into the digestive system and eagerly gobbled up and transported to your trillions of cells. Each cell is being flooded with a wide range of vitamins, minerals, antioxidants and phytochemicals, some of which we have yet to discover. Drinking large amounts of carrot juice may cause the harmless effect of a slight yellowish color of the skin. The beta-carotene present in the skin is a natural protector for the common skin cancer, melanoma. Research has shown this can also protect the skin from the damaging effects of the sun. As an added bonus, after a few weeks on a juice fast, your skin will feel velvety soft. Unless carrots are fresh, the juice tastes better if they are peeled. If you don't have the time to peel, put older carrots in the sink and scrub with a brush. Speed of juicing is another good reason for finding your carrots fresh. Cut tops off, and if older carrots, the tips. A great tip is to use smaller carrots to push greens like spinach, parsley and wheatgrass through the hopper. 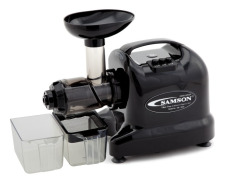 This ensures maximal juice yield from the more fibrous greens. The rich green color that spills into your cup says it all. 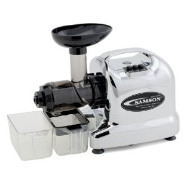 When using the Champion, I alternate between carrots and apples, or another softer produce. The motor does not have to work so hard, and pushing the carrots through is much easier. Surprisingly, some people find carrot juice heavy and pungent in taste. Peel the carrots, or simply add a half or whole lemon to the mix to lighten the flavor. This was all it took to make a vitamin-rich drink palatable to my young daughters. Carrots provide a natural blast of high energy. The sugars are released more quickly than from white sugar but without harmful effects. A mug of carrot juice in the morning will give you a competitive edge over coffee drinkers. Due to effective storing methods, in Canada carrots often found in the grocer will be from last fall’s harvest. Local, new season’s carrots begin to show up in late September, and they’re plump, sweet and cheap. This is one reason I choose late fall as the time for my yearly 20-to-40-day fast. Juicing three to five pounds of carrots a day is standard for juice fasting. In purchasing carrots for juicing, look for large juicing carrots (often called horse carrots) in 50 lb. bags, sold at your local vegetable wholesaler at an affordable price. Carrots should be firm, smooth-skinned, without cracks or small rootlets. The brighter the orange color, the sweeter the carrots. Always remove leafy green tops before storing, or the leaves will draw the moisture and nutrients from the roots, causing them to wilt. Carrots will keep for weeks in the refrigerator and months in a root cellar. When juice fasting, I will leave a 50-pound bag of carrots in the corner of my kitchen with little loss. Keep an eye out for any carrots going soft and remove them quickly, to prevent contamination of other carrots. Carrot juice is the main base for all of the vegetable juice combinations I make. It is delicious, sweet and readily accepted by children. A classic combination is carrot and apple. You can add just about any vegetable to this great base. adding flax to your juice is a great suggestion! Just wanted to add that by placing a teaspoon or more of any extra virgin oil (Olive, Walnut, Flax etc.) into your carrot juice, you will better absorb carotenoids and fat soluble carotenes. Ron is the greatest Christian writer of all time. He's even a better writer then me, and that is saying a lot.